I was planning a different blog post today. However, this weekend’s events — the descent of hundreds of neo-Nazis and other white supremacists on the peaceful college town of Charlottesville, Virginia, the terrorist act by automobile (a weapon employed by terrorists in France and the U.K.) that took the life of a 32-year-old woman and injured 19 others, and the refusal of the U.S. President to denounce right-wing extremism and terrorism (claiming the fault lay with “many sides”) — has brought the nation to a crisis point. 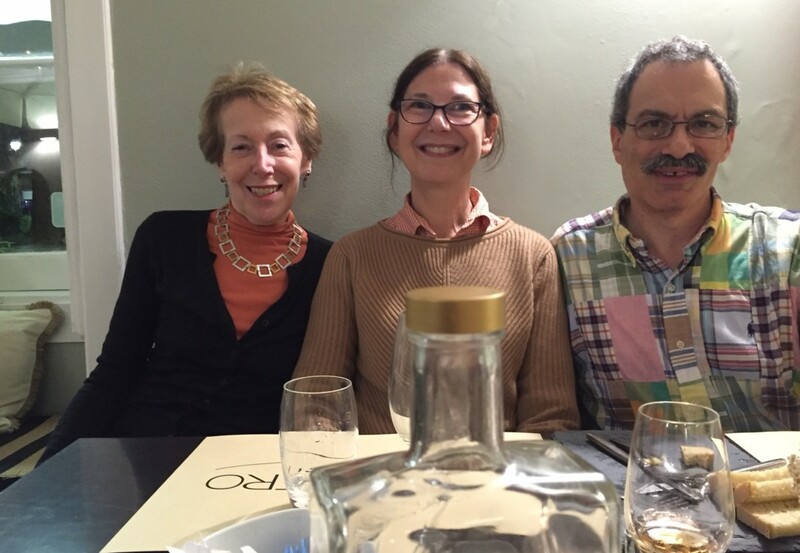 Richard and me with author Cynthia Levinson (left) at the dearly departed De Castro in Lisbon. Photo by Sanford Levinson. In May 2016, I had the pleasure of dinner with one of my favorite authors for young people, Cynthia Levinson, and her husband, Sandy, when they visited Lisbon. We selected one of Richard and my favorite restaurants, the now dearly departed De Castro, where we enjoyed an excellent meal and excellent conversation. At the time, Cynthia’s biography of Hillary Rodham Clinton had recently come out from HarperCollins. 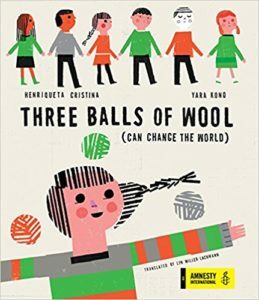 The book had garnered great reviews and was selling well, with bright prospects for future sales. She and Sandy, an esteemed Constitutional scholar who had testified to Congress, were less optimistic about their work-in-progress — an examination of the major flaws of the Constitution and how it has measured up in comparison to 20th century constitutions in places like post-apartheid South Africa and the new democracies of Eastern Europe. But now the tables have turned. No one’s buying a biography of Hillary Rodham Clinton, but Fault Lines in the Constitution: The Framers Their Fights, and the Flaws That Affect Us Today, published by Atlanta-based Peachtree Publishing, is the book we needed yesterday as we face our current crisis. As we see in places all over the world, including those eroding democracies of Eastern Europe and the former Soviet Union, constitutions are only as good as the willingness of elected leaders to obey them and the willingness of citizens to challenge them when they don’t (or not put people uninterested in rule of law in positions of power in the first place). 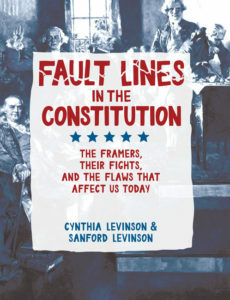 However, as Fault Lines in the Constitution points out, the U.S. Constitution has some unique features that have turned into major bugs. Not the least of these is the Electoral College, which for the second time in a still-young century has made the second-place popular vote-getter President. Another problematical Constitutional provision is laws on voting that vary from state to state and that since the Civil War have often been used to disenfranchise people of color. Today, this growing problem potentially turns the Democratic Party into a near-permanent opposition party. This has created a vicious cycle leading to less accountability and greater extremism. In many districts throughout the country — and from what people who live there have said to me, the district that encompasses Charlottesville is an example — carefully-selected voters have elected Congressional representatives whose words and actions have in turn emboldened extremists living within the district and made others feel unsafe. Political scientists have written about the tendency of liberals and other Democratic voters to congregate in cities (some of which, like Austin Texas, and Salt Lake City, Utah, have in turn been sliced up to maximize GOP representation), and while a number of factors may drive more left-wing voters to cities, isolation in hostile exurban or rural areas in which elected representatives contribute to the hostility is certainly one of them. It played a role in my husband’s and my decision to move from a suburb into the city of Albany in 2005, and I have heard from other people stranded in these deep “red” areas that they are moving or planning a move to safer ground. Of course, politicians on both sides are guilty of taking advantage of gerrymandering. The flip side of lawmakers who feed off of and egg on right-wing extremist constituents is corrupt Democratic lawmakers who enrich themselves and their families because they know they will never be voted out of office in 80-98% Democratic areas. Fault Lines in the Constitution will not be officially published until September 2017, but the authors have already set up a website to discuss more recent events and how the Constitution might address them. One mark of a crisis is that fundamental principles that we have taken for granted are now under discussion and debate, and it’s important for all of us to inform ourselves.